The magistrates’ timing was quite deliberate, quite precise. It doesn’t matter that two of the seven people who did it were women. The plenum of the Supreme Court chose the afternoon when much of the Panamanian population was headed toward the Interior to issue their ruling divesting the court of jurisdiction over Ricardo Martinelli. It was a cynical, abusive act — nothing new or creative but just another insult by an institution shorn of credibility. They may protest that they didn’t throw out the charges, that they just transferred the trial to the lowest level of criminal court. Yeah, so Martinelli’s legal hoodlums can again file motion after motion and interlocutory appeal after interlocutory appeal until comes they day when the untried Martinelli will again be before the high court arguing that the statute of limitations has run. There is no “legal” solution to this. There is a constitutional solution. That would be a new constitution that has among its provisions not a procedure or a law, just an outright ban against any of these seven specific individuals serving as judges, holding a government post or practicing law. Does somebody protest that there is no law against this sort of timing? These seven magistrates time their pro-corruption ruling because they knew it was wrong and sought to conceal it from the Panamanian people. That’s offense enough, whether or not there is any statute on the books. 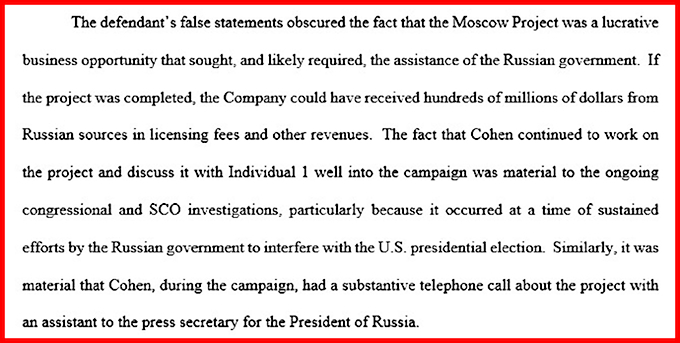 From Robert Mueller’s sentencing memo in the Cohen cases. The US Attorney for the Southern District of New York submitted a separate memo, which was about different crimes but just as damning. He ordered people to break the campaign finance laws. He ordered people to contact the Kremlin in search of special favors for his business, while he was running for president. People are going to jail because they lied for him. We still don’t know the extent of the offenses that the special prosecutor will cite, but what’s out now is damning. Are Republican senators sneering that they have they have the votes, that nothing can be done about Donald J. Trump? Perhaps if the guy sinks to single-digit approval ratings and their own standings with the voters follow the trend, they will be alarmed. A problem that they created. A problem that they might go into panic mode to resolve. For Democrats, it’s not a time for compromise solutions. It ought to be the start of two years of debate and incubation of a plan of action to take to the voters in 2020. As money matters have to come from the House, it also should be two years of saying no to funding for Republican initiatives. Just because I might look like a skinny scientist doesn’t mean I’m not going to crack down on crime here. Next articleMujica, ¿Cual es el valor de tu libertad?